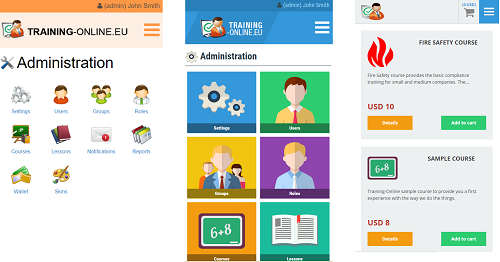 Training-Online.eu offers a variety of skins to be used as the Graphic User Interface either for LMS itself of for eShop. You may use predefined skin or skin where you may adapt colors and logo and get the same look as your webpage or company theme. Currently, total 9 GUI (Graphic User Interface) versions are available in the SKIN module to be chosen. 2 themes are available (3x ICON GUI SKIN ; 3x FLAT GUI SKIN ; 3x eShop GUI SKIN). • GUI Fully Responsive Standard – this free skin is the standard predefined user interface, keeps our standard color and logo branding, and allows no changes. • GUI Fully Responsive Logo – offers to place your own logo into the header banner. Our standard color scheme remains. • GUI Fully Responsive Logo & Color – allows full flexibility to adapt to your logo, favicon and color scheme. In the administration, click the Skins module and enter the list of available skins. Show and edit - allows to see the skin preview, My Study or eShop landing page is shown. Free skin is set by default and no changes available. Other skins allow to adapt logo or colors and logo. Activate - Activates the skin and the subscription days are started. Paid skins have the subscription period (usually 365 days). In case the paid period expires the sin is suspended to free skin. You may avoid those situations by extending the subscription period. Extend - Extends the period already paid with additional subscription package (usually 365 days). For skins where the editing of skin or logo available, the color pallet appears. You may change different areas of the GUI, just pick the zone or text color and change it, upload logo, favicon or remove forum icon. You may select the colors either by picking in color picker or set the color by RGB values which is better way if you know exactly the colors used on your webpage or defined in your company color manual. To see the color scheme just press Preview. To save the color and logo scheme use the save button. Please bear in mind that in case the skin is Active (in use), all the changes you make will be visible to all system users immediately! Once the file for logo or favicon is loaded, you have to still Set as Logo or Set as Favicon button in order to activate it for your desired use. The same way you may unselect the picture back to standard Training-Online.eu logo. In case you want replace the logo or favicon with a new picture, simply upload a new file and set as logo or favicon, it will change the file. Edited 5 time(s). Last edit at 04/14/2019 09:41AM by Masteradmin.